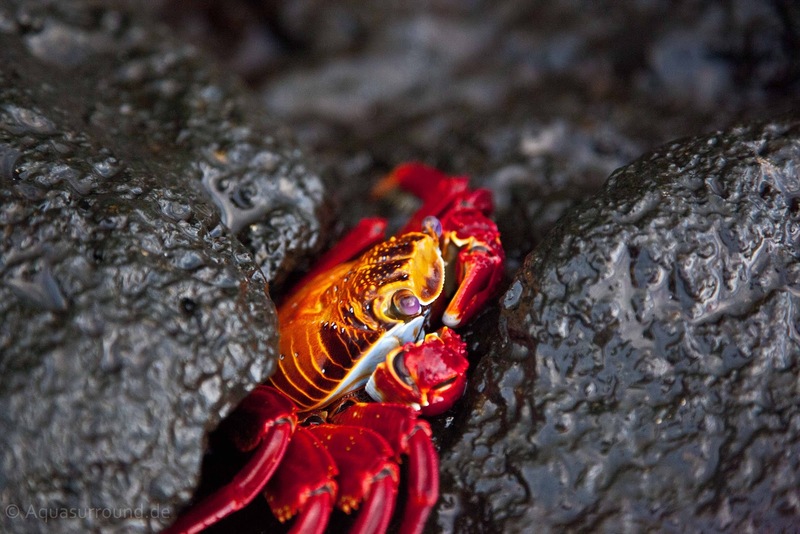 Upon landing, you will see literally hoards of Sally Lightfoot Crabs resting and eating on the volcanic terrain that identifies the islands throughout the Galapagos archipelago. This crab species is found along the Pacific Coast in both North and South America, but like most creatures in the Galapagos, it has developed some interesting adaptations. Tiny young Sally Lightfoots have undeveloped soft grayish shells which provide them with the camouflage necessary to blend perfectly into the ashen colored volcanic rock on which they rest and feed and thereby protect them from predators. As the Sally Lightfoots grow older, their shells harden and turn a bright shade of red or rust. You might wonder why this color doesn't draw predators, as the adult crabs certainly become noticeable to the large predatory birds above. Still they are safe because their shell is nearly impermeable; the color does not create a hazard like a flashing red beacon saying, “Here I am. Come eat me.” The color does, however, serve an important purpose: it attracts one crab to another for mating. The name “Sally Lightfoot” is said to have come from the name of a Caribbean night club dancer. According to lore, she wore brightly colored dress, danced with considerable agility and used her quickness to avoid grasping hands. Like the woman, the crabs do a quickstep when anything comes their way. Their agility is well recognized and allows them to elude most human or nonhuman would-be trappers. Another interesting feature of these ubiquitous creatures is how much weight they are able to carry. I've seen a tiny Sally Lightfoot dragging a really large dead one away, my assumption is that the big one is going to be served for dinner. They have remarkable strength, somewhat like an ant that can carry many times its weight. Once you see a Sally Lightfoot Crab, you will know what to look for and be drawn to their color and shape for many photo opportunities. 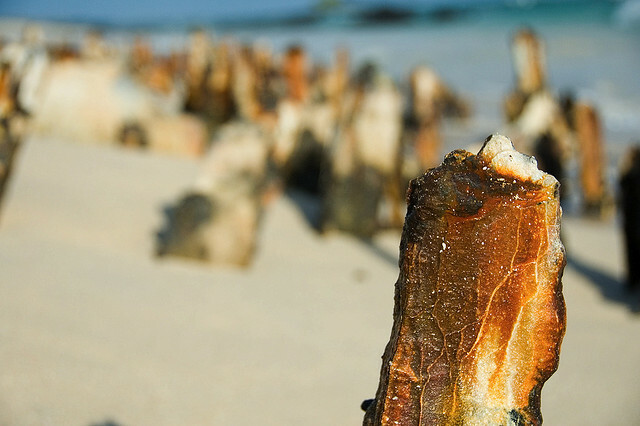 Moving onto Bachas Beach itself, you will see the evidence of its human history and the explanation for its name. During World War II, the United States had a considerable presence in this area of the Pacific Ocean. When the war ended, barges were simply abandoned. Two of those barges ended up on the beach we now refer to as “Bachas.” Bachas is a mispronunciation of the word barge. Still on the beach are some rusted remains of the actual barges which, over time, have been covered up by the elements. 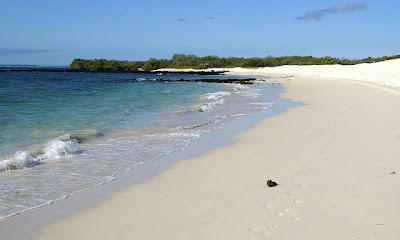 Also on the beach are the first of many marine iguanas you will see on your voyage. The Galapagos Marine Iguanas are the only iguanas in the world to get their food from the water. I have written extensively about this amazing endemic creatures in an earlier post, about land and marine iguanas, which you can find here. Directly behind the beach, just before the salt brush, you will see the nests of Green Sea Turtles. 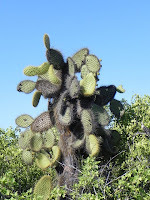 Whether you see the actual turtles or not depends on the season during which you visit. The Green Sea Turtles start to build their nests and reproduce in December and their nesting activity continues through April. The nesting sites often will be delineated by rings of stones placed there by Naturalists whose job it is to protect the Galapagos species. 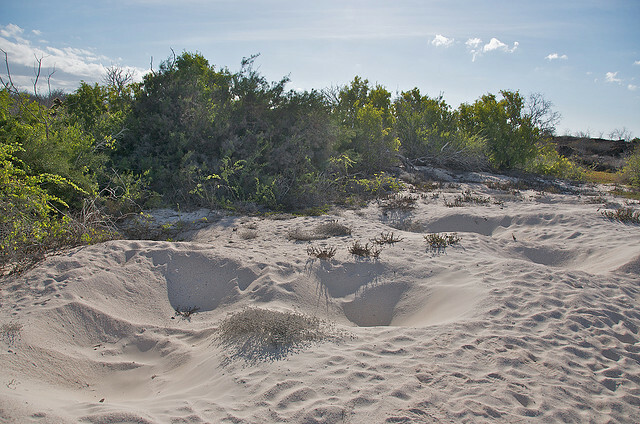 The nests are large indentations in the sand and are quite noticeable and remarkable. 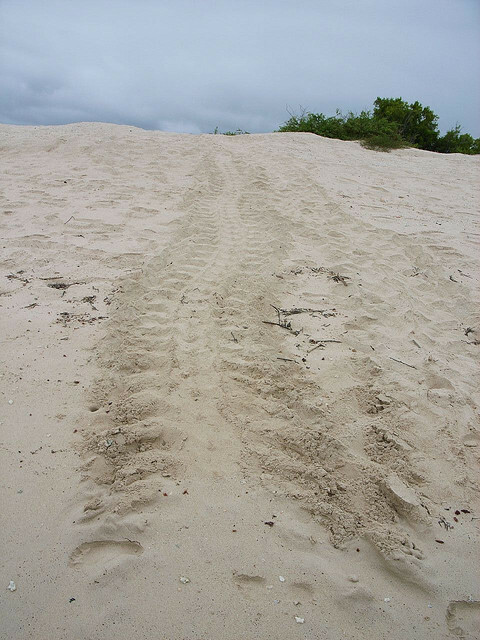 You also might be lucky enough to see the tracks of these large creatures coming or going from the sea to the nesting site. The turtles are in the water during the day and wait in the water along the shoreline before slowly crawling their way up the beach and back to their nests to protect the eggs at night. At dawn they make the slow journey back into the water. But, even then you are not done with exploration at this one landing site. Walking a little further on the marked trail, you will come to a lagoon with flamingos. Sometimes you see one, sometimes many. They are always a special and much-sought-after photo op. Don't forget to look at the flora as well. There are some very interesting cacti on the walk. 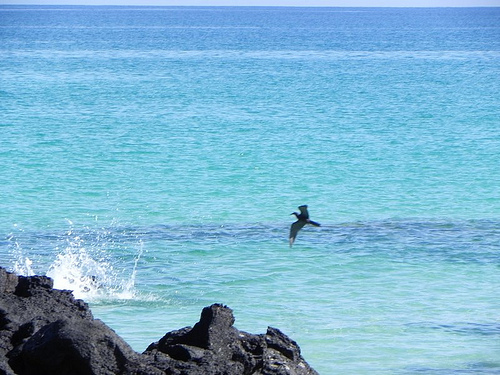 Back at the beach after your hike, you may want to go for a swim, a walk or simply look for the birdlife. Among the bird species I’ve seen on Bachas Beach are Stilts, Herons, Pintail Ducks, Brown Noddies, and, of course, Frigatebirds. wow nice animal blog you define nice word and other animals.